The band proposes dance music from Liguria often associated with other tunes coming from close cultural areas: mazurka’s, sbrandi and monferrine from Liguria and Piedmont tie up effortlessy with French valzer’s and schottische’s. The song repertoire has a strong emphasis on Ligurian dialect: traditional and popular songs are arranged by the band with creativity and flair. Liguria, it’s language, dance tunes, melodies and sounds are the core of the suggestive music repertoire proposed by Liguriani. A five piece act which combines the rythm and the groove of a celtic music band with a wide array of musical influences (from manouche swing to bal musette, from Occitan roots to Italian chansonniers), playing old songs and bright, dazzling dance tunes. All the members of Liguriani are well known musicians in the Italian folk scene, and have a wealth of musical experiences, from studio and radio recordings to international music tours in Italy, France, Spain, Germany, England, Ireland, Finland, Denmark, Canada and Usa. The band has recently released their debut album (Suoni dai Mondi Liguri, Felmay Records, 2011), which is getting raving reviews from specialized press (Giornale della Musica, Manifesto, Folk Bullettin, Folker DE, Songlines UK, Newfolksounds NL and others). Their music has been broadcasted by Rai Radio 3, ABC Australia, CBC Canada, RTVES Spain, WDR Germany. 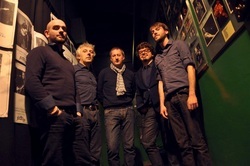 Liguriani have played in Italy, Spain (festival Tolo d’Asturies 2009), Switzerland and Germany. In january 2012 the band played in Glasgow, at Celtic Connections, the most prestigious european festival devoted to celtic music. During 2012 and 2013 the band will tour again Germany, where they will perform in some very important venues and festivals such as Rheingau Festival (june 2012) and at the WDR concert hall in Koln (march 2013).